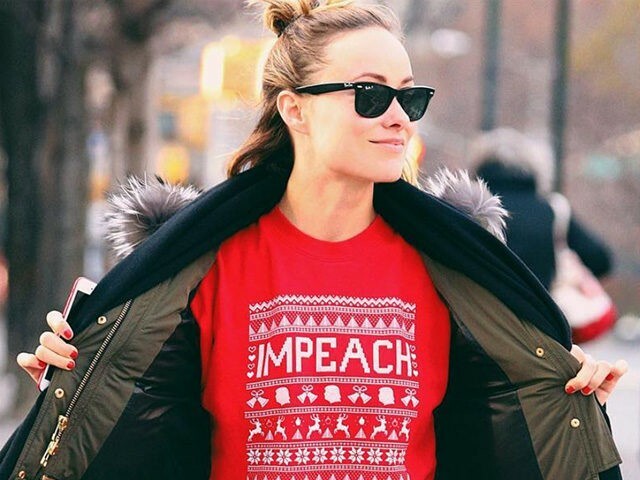 24 Dec 2017 Washington, D.C.
All actress Olivia Wilde wants this Christmas season is for President Donald Trump to be impeached by Congress. In an Instagram post, Wilde wore a red Christmas sweater with the word “Impeach” mock-stitched across the front, showing off the jab at Trump by holding her jacket open for photographers to see. Wilde wrote in the post “#GiftOfImpeachment” while also tagging the left-wing women’s organization “March On” which sells the sweater, and posting the prayer-hands emoji with the picture.